In the thirty-first century, intergalactic travel is facilitated by means of the use of the rare element Illyrion. The spur to action for Lorq Von Ray, the protagonist of Samuel R. Delany's 1968 novel Nova, is neither epic nor heroic, but merely a tedious exercise in economics. A sense of disappointment must inevitably pervade the novel once the reader learns that Lorq's intention to sail through a nova and collect several tonnes of Illyrion in one maneouvre is not going to prevent some catastrophic galactic event or overthrow an ancient, nameless evil, but merely secure the future of his family's industrial empire. His father adumbrates the economic determinates that drive Nova's scant plot forward in one of the numerous passages of prolix, coma-inducing verbiage that litter the novel: "I've figured that at the present rate of expansion, in fifteen years the Outer Colonies will be able to lower the cost of Illyrion by almost a quarter. During that time, [rival company] Red-shift is going to try to kill us[...] The only way we can survive is to kill them first: and the only way we can do that is to figure out a way to get Illyrion down to half price before it goes down to three quarters" (p. 92). Why anyone should care is another question altogether. Delany attempts to imbue the narrative with some of the colourful hues of space opera by portraying Lorq's antagonist Prince, the aristocratic leader of the Red-shift empire, as a semi-cyborg psychotic. However, the effort he expends in attempting to provide a motivational back-story by portraying the youthful encounters between Lorq, Prince and his sister Ruby backfire badly as the reader can think of Prince as nothing more than a spoilt child on encountering him again later in the work. There are some enjoyable elements tucked away within Nova; despite the woefully heavy-handed use of the hoary metaphor of 'the musician who speaks through his instrument' ("a gypsy with a syrynx instead of a larynx", p. 136), Delany's descriptions of Mouse's virtuosity on the 'sensory syrynx', which projects sounds, holographic images and scents as well as music, are probably the most entertaining passages in the text. Additionally, some of the ideas that Delany was thinking through in the late Sixties have a contemporary resonance beyond that which he may have expected: "At the beginning of that amazing century [namely, the twentieth], mankind was many societies living on one world; at its end, it was basically what we are now: an informatively unified society that has lived on several worlds" (p. 148). Obvious corrections regarding global economic inequality aside, the former element of this proposition stands without the need for annotation; replace physical worlds with virtual worlds, and the latter also has more than a ring of truth about it. Consider also the following passage, with its interesting contemporary use of the metaphor of the 'net': Katin reflects on how "each individual is a junction in [the] net, and the strands between are the cultural, the economic, the psychological threads that hold individual to individual. Any historical event is like a ripple in the net[...] it passes over and through the web, stretching or shrinking those cultural bonds that involve each man [sic] with each man" (p. 163). Delany's imagining of a world where trades and skills are facilitated by means of sockets that plug into the operator's central nervous system (a concept invented in the novel by 'Ashton Smith' (pp. 203-5), perhaps echoing Clark Ashton Smith?) has become something of a SF mainstream trope since Delany's exposition of the same, although other writers such as Cordwainer Smith examined the idea first. Delany's attitudinal dispositions and habitual ticks more than conspire to destroy any pleasure that the reader may have been able to take in the novel had he not resorted to such bouts of wilful self-indulgence. Delany is the very worst offender for 'info-dumping' that I have ever encountered in genre fiction, and Nova is littered with his heavy-handed erudition, which is not what I would have expected from an author who has had a parallel career as an educator. The shrill tone of these sections bespeaks a distasteful condescension which a twenty-first century readership, expecting its information to be mediated through communities of purpose rather than be disseminated through the dull drone of éminence grise, will not receive well in the future. Delany's development of 'alien' language patterns grazes the eye within pages of the commencement of the novel, taking delight as he does in constructing a hall of mirrors for unsuspecting grammatical elements to trudge through and endure their unwelcome distortion. As if narrated by Yoda much of this novel is. Delany's insistence on the truth-value of tarot cards is another Sixties excresence that dates the novel badly: 'If somebody had told me I'd be working in the same crew, today in the thirty-first century, with somebody who could honestly be skeptical about the Tarot, I don't think I would have believed it' (p. 118). Many more objectionable and pretentious elements coalesce in the person of the crew member Katin who is collecting hundreds of thousands of notes on a voice recorder in anticipation of his embarking on the writing of his magnum opus novel, a mode of discourse which has become redundant by the Novas imagined contemporary present. It is hard to say whether Delany mocks or reifies Katin's delight in knowledge for knowledge's sake, but the reader has lost the will to consider such issues having had their natural inclination to question Delany's intentions beaten out of them by lecture after purposeless, directionless, joyless lecture: '"History? Thirty-five hundred years ago Herodotus and Thucydides invented it"' (p. 124). I may never be able to pick up the Landmark editions of either of these authors again without thinking of Nova, which is another reason why I am glad to return it to the shelf posthaste. Mouse's dismissal of Katin's agonies of indecision regarding an appropriate subject for his work are, however, amusing: "I was born[...] I must die. I am suffering. Help me. There, I just wrote your book for you" (p. 164). The final encounter between Von Ray and Prince is predictably anti-climactic, and the premise that a ship could fly through a nova so under-considered that even Delany thinks it only appropriate to draw a veil over the event that the entire novel has been building up to, and not describe it. An irritating entry to the SF Masterworks series that I cannot see myself returning to at any point in the near future, or come to that the far future. Man, I just finished dragging myself through to the end of this one. Tedious, boring and quite possibly completely pointless. Some of it was enjoyable but I can't remember which parts they were, such was the effect of the rest of the book. The Yoda-grammar got on my nerves, as did the twins finishing each other's sentences. I like ensemble casts of characters but in "Nova" each character wasn't distinct or interesting enough to justify their place in the narrative. It seems like Delany thought it was enough just to give each character some kind of gimmicky trait and be done with any further development. For me, "Nova" was a big disappointment. I've got Delany's "Babel-17" waiting for me on my shelf but it's going to take a while for the aftertaste of "Nova" to wear off before I feel like reading it. I'm glad it wasn't just me, then! Yes, I'll have to slog through B-17 too at some point if I am ever going to finish this project, but believe me, it won't be for a while yet. Loved it. 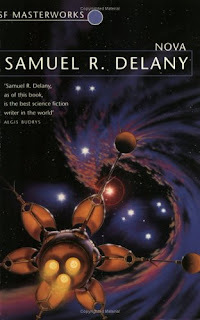 Was it Alfred Bester who said "As of this book, Delany is the best science-fiction writer in the world"? Thank you for your comment. That's a fascinating quote, thanks for sharing. I am a great admirer (like almost everyone else, I suspect) of Bester's sinewy, direct prose so am intrigued as to why it may have rated Delany so highly.